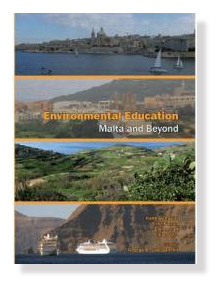 A new textbook entitled Environmental Education – Malta and Beyond, edited by Mr George Said Zammit, has been published. It provides students and teachers with a resource from which to get the most out of Environmental Studies as offered in schools. It follows the requirements of the Environmental Studies SEC 13 syllabus. The book is written for students of average and above average ability and encourages both students and teachers to address the wider environmental issues of the 21st century. The book, whose authors are experienced practising teachers, follows the specifications of the syllabus closely, covering the six themes: The World-Our Home, Management of Resources, Human Resources, Human Population, Human Communities, Work and Leisure and Managing a Nation. Contemporary issues such as climate change, biodiversity, renewable sources of energy, waste and water management, housing, health services, transport, heritage, the economy and work in Malta are also covered. This textbook provides clear and precise information, facts and case studies; well-explained concepts and current issues; full colour photos, maps and diagrams to help illustrate points; a bright and colourful layout; coverage of the three-year course; a clear explanation of geographical processes; ideas for the practical component of the exam; an easy-to-follow format, with difficult words explained in the glossary and a list of related references and websites.